Could One Petition To Fox Searchlight Bring “Margaret” Into Awards Season? Could One Petition To Fox Searchlight Bring "Margaret" Into Awards Season? While Fox Searchlight is revving up major awards campaigns for several of the critically-acclaimed movies the company has released this year, one title has been conspicuously absent from the buzz: Kenneth Lonergan’s “Margaret,” the follow-up to his debut, “You Can Count On Me.” Searchlight released the urban coming-of-age drama on a handful of screens in New York and Los Angeles at the end of September, four years after it was originally schedule to come out. The delay resulted from years of disagreement between Lonergan and the studio, which grew impatient with the director’s incapacity to finish editing his long, ambitious narrative and eventually took the matter to court. The final product, which was completed with assistance from producer Martin Scorsese, ran two-and-half hours longer, still significantly shorter than Lonergan intended. Neither he nor his cast played a role in promoting the movie, which grossed a meager $3,000 in its opening weekend and dropped out of theaters entirely a few weeks later. Now, a few critics have joined forces to give “Margaret” a second chance. Yesterday, a number of critics from different parts of the country entered into a dialogue on Twitter about the results of the New York Film Critics Circle’s awards, which awarded its top accolades to “The Artist” on Tuesday. While that movie played in competition at Cannes and has now been positioned by the Weinstein Company as a leading Oscar contender, “Margaret” has had no such help. According to film critic Jaime Christley, a contributor to TheFilmasuraus.com, Slant Magazine and Fandor’s Keyframe blog, it was critic Mike D’Angelo who suggested that if enough of them wanted “Margaret” to screen for critics’ groups or for Searchlight to circulate awards screeners–as they have for various other titles–they should petition the company. But can it make a difference? So far, Christley has sent the petition to around a dozen publicists and other Searchlight reps, with the hopes that the company can screen the movie for critics outside of New York and L.A. That possibility could have a significant impact on the voting of groups like the Online Film Critics Society, which has members all over the world. “Advocacy for this film has created a sense of community around it,” Christley said. A rep from Searchlight provided Indiewire with the following statement: “Critics were sent invitations to pre-release screenings when ‘Margaret’ was released in September, and many reviews of the film have run. Since the film is no longer in theaters, we have set screenings for any critics’ group members who still need to see the film within any applicable deadlines.” That doesn’t address the possibility of the film becoming available to voters who don’t live near those cities, who might be out of luck for now. Full disclosure: I’m a member of the OFCS and support the effort to keep “Margaret” in the awards season conversation. I like the movie quite a bit. Lonergan brings an extraordinarily powerful dimension to his story of a restless teenager (Anna Paquin) going through various stages of rebellion and enlightenment after she accidentally causes a grisly street accident. I fear, however, the time for a campaign of this nature would have been several months ago, when it might have boosted the movie’s theatrical performance. If “Margaret” managed a larger profile when it was released, the studio might have felt more confident about investing resources in its continuing life. However, with its dark plot and philosophical leanings, it remains a tough sell for many audiences as well as critics. Still, Lonergan’s perceptive look at his heroine’s desire to make a different and the confusion she faces when the world turns against her has enough to distinction to deserve at least a screenplay nomination. 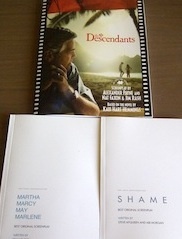 Unfortunately, Searchlight has already demonstrated its commitment to “The Descendants,” “Martha Marcy May Marlene” and “Shame” for that category, circulating screenplays for them to various critics groups. For now, the best prospects for keeping “Margaret” in the conversation may lie with the imminent barrage of top 10 lists. Nevertheless, the petition continues to grow.